I've mentioned before my love for vintage Valentine's. Well, I also have a collection of vintage Christmas postcards and vintage Easter postcards. And Vintage Lucys is everything I love about those cards, literally, right on the front of little girls' clothing. Plus, they're made really well with high-quality inks that are pigmented directly to the garment so there's no craking or peeling. And yes, they can be machine washed and dried. Would you like to know which of the 698 items in her store I especially like? 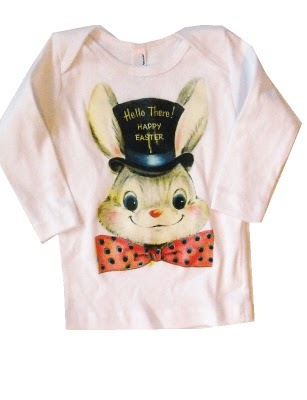 I immediately fell for these bunny tanks, tees and dresses. I think they are perfect for an Easter egg hunt and they're available in sizes that would fit the tiniest baby right up to an adult. I think this is my favorite dress -- and I'm pretty crazy about the little girl wearing it below too! But I really like this dress too . . . and, of course, the little girl who has it on. And this is the design that started it all for me. Luckily, it had the brand name right on the front. So enough about what I like. What do you like? Go poke around the Vintage Lucys etsy store or visit the Vintage Lucys website and come back and tell me what caught your eye. One lucky commentor will win a "Charm School Dropout" tank. Which, in my opinion, is also adorable and downright funny. The giveaway will remain open until Wednesday night at 11:59 p.m.
VINTAGE KEWPIE DOG dress is my favorite! How sweet and unique. I like the Retro Scottie dog shirt -- esp. as my little girl is getting a scottie in a couple months! Great finds! The little mommy, double ruffle dress. Oh my, Oh my...what a cuteeeeeee site. Your girls are the best dressed girls in the entire world. So So Adorable. What adorable clothing! Too hard to pick just one...I guess the Ragland Pouty Kitty Double Ruffle Dress. 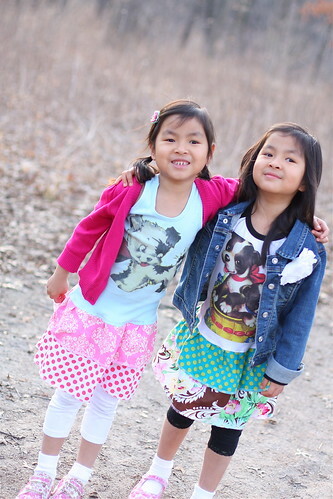 In the last picture of the two girls together they look like models for a children's clothing magazine. Have you ever considered that? I love the Rockabilly Cowgirl dress. 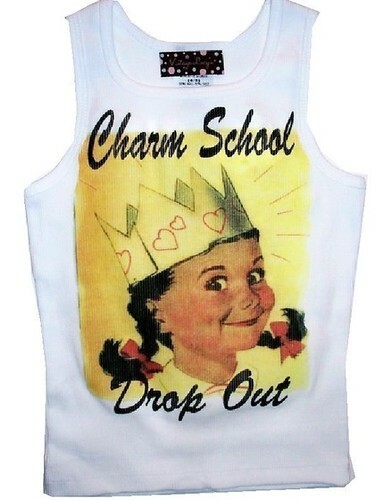 That charm school dropout tank is so great! She looks so naughty and fun!! POLKADOTTED KITTEN DRESS - so cute. .RETRO BOHO TANK - loved this one! 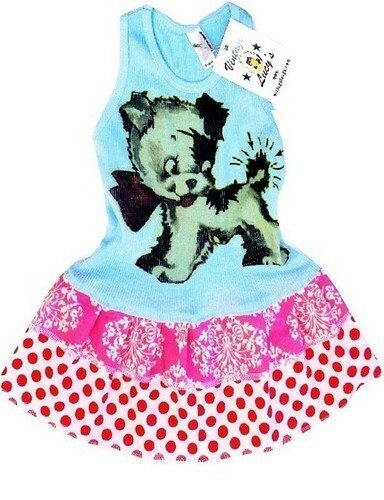 My FAVORITE is the VINTAGE KITTY CAT BOUTIQUE CHILDRENS DRESS - THE POUTY KITTY RAGLAN. I LOVE that dress soooo much!! What cute clothes - how do you always find the best stuff???? My favorite is the Rockabilly Cowgirl Dress. I found two different styles and I heart them both!! Oops! Forgot to mention that I LOVE the Santa dress with peppermints skirt. Also, my dear friend will be getting the cherry tea towels for her bday. I ADORE the Vintage Hula girl design! I think I NEED it in a tank, shirt, dress. The vintage mermaid one is a pretty close second though. Perhaps on of each to start with. The Vintage Lucy's Dress is my Fav!! Thanks for sharing this one! Are you kidding me? How do you find such cute things? I do have to say that I'm smitten with the puppy potty pants. Absolutely sweet! We like The Sweet Summer Double Ruffle Dress. We also snuck a peek at the accessories...the Swallow Charm Necklace is really cute, too. We like the dress the best, though. Thought Kenna and Michal might get a kick out of Marissa's art in a magazine. If you go to www.sunflowerpub.com/magazines then click on the Shwanee Magazine icon, and turn to page 28 you can see Marissa's article. She is also the spring cover-girl! Right now we just have a family blog at www.marissaathome.blogspot.com but in a week or so she will have a website at www.paintingsbymarissa.com. It's almost ready! The tangerine kitten dress is my absolute favorite by far, though I lust over Vintage Lucys so often my husband knows her website's playlist by heart...ooops. Love the shabby chanderlier double ruffle dress...too cute! The little kitty dress is so cute! Darling website! Definitely the vintage girl kewpie dog dress...LOVE THIS!! HA! 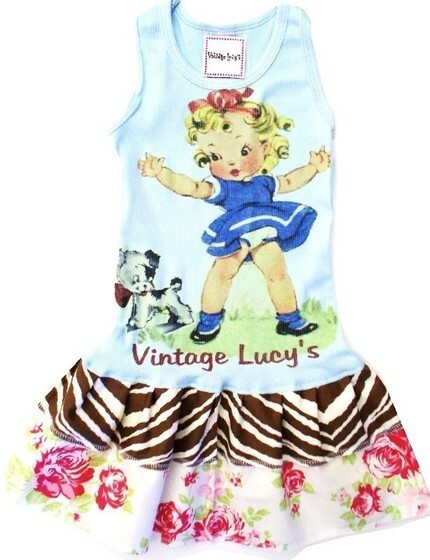 We found Vintage Lucy's last year... looks great with Matilda Jane ruffles too!! I love the Mermaid shirt...it's one of my favorites! The China Doll Dress is precious - of course I think my China Princess would look perfect in it :) Very cute and unique stuff! I love it all, but my fav would be the Charm School Dropout dress! I actually found Vintage Lucy's recently when I bought an overall dress that I just LOVE (I don't see it on the etsy site though). i like the dresses but mostly the headbands with big flowers on it! I love the vintage valentine puppy tea towels. They are so adorable and I have just spent the better part of an hour in her store. It is so cute. LOVe the stuff. Kristi you find the cutest things. Thanks again for this wonderful contest. OMG! I LOVE my VL tees. They match EVERYTHING! Adorable! How do you find these things? I like the simple t-shirt, "Retro Boston Terrier Pedigree Shirt." Super cute! Thanks for the opportunity to enter for a treat! who can choose? I adore vintage lucys- adorable retro clothes that will get everyone talking..I can not get enough vintage lucys! I like the retro hula girl! Ever so cute. I like the ice cream tank and so many more. Thanks for another great contest. I love the Hula Girl tank! Her site is awesome! 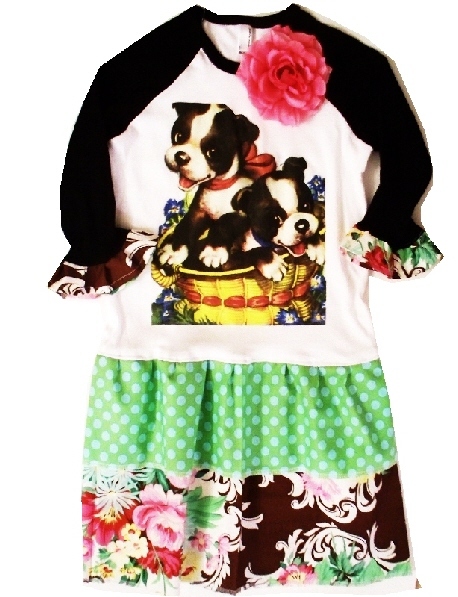 I love the vintage kewpie dog dress - too too cute! I love the cupcake party double ruffle dress. I also love that she makes things for boys too! THE RETRO MERMAID DRESS for sure! My little Ariel fan will love it. I love this stuff, I have some old wrapping paper that reminds me a bit of these illustrations. I love the purple boots your girls were wearing at the maple sugar place, where did you find them? I am in love with the Retro Floral Zebra Sundress ( http://www.vintagelucys.com/item_102/Retro-Floral-Zebra-Sundress.htm ). All the clothes on the website are adorable but this particular one stood out to me and I could totally see my little Jordyn Love sporting this!! I LOVE the pics you take of your girls, btw!!! I love the Vintage Lucy. So cute! How can I possibly choose just one?!? If I must it would be the vintage song bird dress!! Love these. the tangerine kitty ruffled dress is my favorite...so cute- great find! too hard to decide i love them all. happy you've made the choice for me. that shirt is adorable and perfectly describes my little lady! The Very Cherry dress is my favorite. I love the vintage pink trike and the vintage party prints! Too cute! Just one more store to add to my etsy favorites! The Cupcake Party Dress is Adorable!! Retro Mermaid is the one I love...sooo cute! I love vintage! We love the Very Cherry Dress! Great find. THanks for sharing. The Pouty Kitten Dress is adorable! My Hannah would love it!! little mommy is so adorable. What a cute website. Your favorite dress is also my FAVE dress... love it!!!!! So presh just like your girls. Can't wait to order something for my daughter! It's a toss up between the cowgirl and the zebra sundress. Oh my goodness! LOVE the vintage Kewpie dog dress! Must get one for my little one! Thanks! Pouty Kitty has to be it! So adorable! I love VL! I bought my girls 2 tanks last year. I just love her work. Lovin the pouty kitty double ruffle dress... Tate is a freak for "meow meows"... she would LOVE the dress.